No matter what happened on the day history would be made. Either Barcelona would win their 4th title and this side would cement themselves as one of the best sides in the history of football or Manchester United would win their 4th champions league title and Ferguson would undoubtedly be crowned the greatest manager ever, with 3 champions league title’s to his name. Before the match Berbatov Manchester united’s leading goal scorer and Puyol Barcelona usual captain were dropped sending twitter and the world into shock. Abidal return from a liver tumor to play at left back but neither Anderson or Fletcher featured in the starting line up for United. From the starting line ups it seemed that United were unwilling to bend to Barca and that they would play their usual style of football versus the Catalan giants. The first 10 minutes of this champion’s league final was vaguely similar to the one in ’09; United dominated and caused Barca problems early on. One of the main reasons for their dominance early on was due to their excellent high pressing. They contested and won a lot of individual battles They did not allow Catalan side to settle and denied Barca players space and time to pick a ball. During this period United also attacked Barca to the extent where Hernandez was caught ofsides 3 times. They were trying to get behind Barca and although they attacked Barca often they failed to make a break through. A lot of their attempts to get in behind were either stopped by valdes who acted as a sweeper or the offides flag. Even though they were dominant their attack wasn’t incisive and they created 1 shot in this period. With United relaxing their pressing and Barcelona players finding their feet, the tide of the game began to shift. Barcelona started to regain their usual control that they have over matches and in the 5 minutes following United’s dominant spell Barcelona’s had 66% of the possession and started doing what they do best. Each player had a minimum of 2 passing options whilst on the ball which made it very easy for them to pass around United’s midfield. They pushed Dani Alves and Abidal forward to join Xavi and Busquets in midfield to form a base in which they would build play from. Messi and Iniesta operated just ahead of them ready to change the stage of play from build up to attack. It wasn’t just what they did on the ball that helped them regain control though. 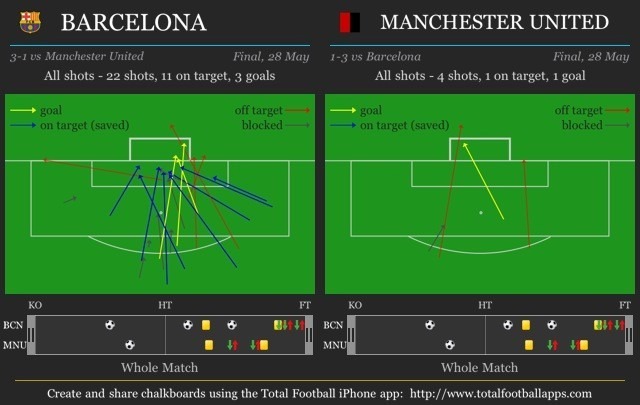 Barca started pressing in clusters and made it hard for United to move the ball from the back. By the end of the first half Barca had nearly 70% of the possession and about 60% of the entire 70 percent was in United’s half. An interesting feature of Barcelona’s game was how they were able to isolate United’s backline and create quick counter attack like opportunities. This would occur when Barca won the ball in central midfield and would rapidly attack the space between the midfield and defensive line with 3 to 4 players . One player usually Messi would dribble at the exposed back line. Whilst the other 2-3 players usually Pedro, Villa, and another midfield runner moved into positions to receive a pass.Pedro and Villa would normally move into the space just outside of United’s tracking-back back 4 and would wait for a through ball. These types of situation created numerous opportunities and even lead to the goal. United’s equaliser wasnt just down to Rooney’s genius; he was helped by a fact discovered2 years ago by Kurban Berdyev Rubin Khzan’s coach, He “noticed that Xavi and Andrés Iniesta – key players in the team – almost never drop back to their own penalty box.” This essentially paved the way for Rooney’s equalizer . After picking up the ball on the right flank and combining with some team mates he was allowed to run at the Barca back-line bare. When he released the ball for the final time to giggs he was free at the top of the. None of Barcelona’s midfield trio had tracked back leaving the space in front of Barca’s back-line open for Roooney to receive the return pass and score. At half time the game was leveled at 1-1 but with Barcelona getting the better of play. They dominated possession and created more chances. Park caught out of position in the middle leaves space above fullback Messi picks it up moves closer to the goal and shoots. Great work from Messi to beat Evra on the flanks drawing Man United’s defenders deep in the box. Smart positioning from Villa staying in space at the top of the box to receive the pass. Great finish! By forming diamonds in central midfield Barcelona were able to move the ball around United’s midfield with ease. Essentially when a Barca player had the ball away from the flanks his passing options would form a diamond around him. Example if Buquets was at the bottom of the diamond Xavi,Iniesta, and Messi would move close to him. If Xavi was on the ball Busquets, Iniesta, and Alves would move ahead or around him to give him passing options. 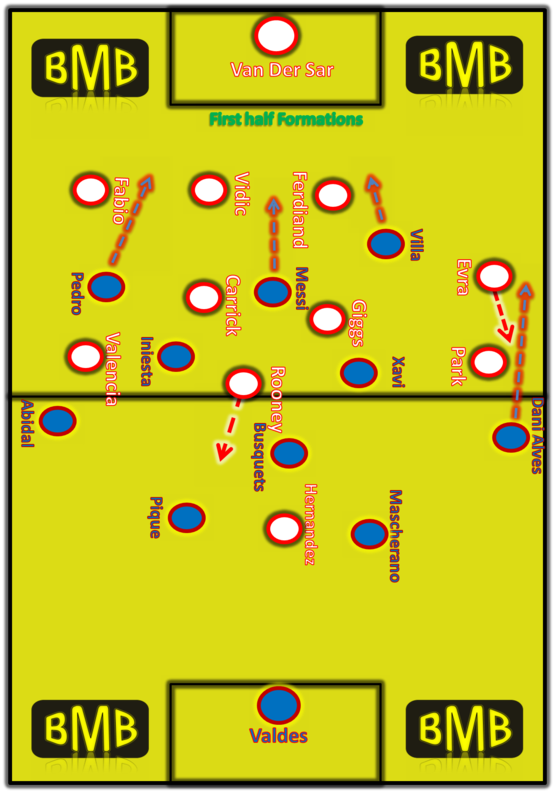 Barca moved the ball within the diamond with 1 touch passes whilst under pressure until a member in the diamond became free. He would act as the transitioning player moving the ball forward from build up to attack. 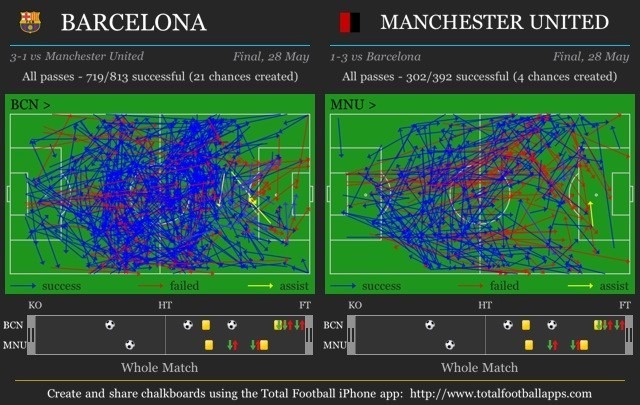 With United really using 2 players in central midfield, Barcelona had a field day passing all around them. Valencia and Park were often too far away from the midfield two and Rooney did not drop deep enough to help close down Barca’s diamonds. This meant whilst Carrick and Giggs moving to close down the man on the ball; they were leaving space for for the ball holder’s passing options. As a result Barcelona had a passing field day with 68% of the possession by the games end and 719 passes completed. In comparison united only completed 302 passes. With United’s possession limited so much they resorted to direct attacking strategy. They moved the ball quickly down the flanks and would often try to catch Barca out.United’s attacks were ineffective though. One reason Man united’s attacks were so ineffective was due to the supporting players of the man on the ball. They rarely moved back to provide an easy passing option for the man on the ball. Instead they moved into positions to receive the through ball and Barcelona defending in numbers easily cut these passing options out. Barcelona defended the flanks well with Villa and Pedro even dropping back to help the their fullbacks defend United’s preferred area of attack.Man united ended up with 4 attempts at goal. 2 from the first half and 2 from the second. Their attacks were neither incisive or effective and Barcelona’s defense coped well. In America we say possession is nine tenth’s of the law, but Barcelona really make their possession count. They pass they move and they create wonderful opportunities with the ball. Somethings can’t be explained with words alone so i leave you Barcelona’s to watch Barcelona great attacking play and historic performance.